Ankle boots combine the advantages of classic low-rise footwear with popular boot design—these stylish and elegant shoes are suitable for (nearly) all seasons. Our collection of Goodyear-welted women’s ankle boots impresses with premium leathers, detail-oriented designs, and extraordinary wearing comfort. 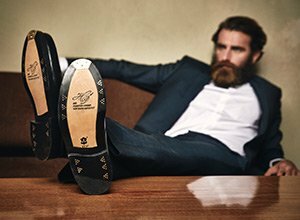 Moreover, each model in our collection is fitted with a vegetable-tanned leather sole made by Joh. Rendenbach in Trier, the world’s premium purveyor of luxury leather soles. The ankle boot is a special type of boot. Its shaft usually reaches the ankle or only extends a few centimetres above it. In the late Biedermeier era the ankle boot had already become a cherished fashionable shoe. At this time, working class women chiefly preferred lace-up ankle boots made of firm leather, while women belonging to finer society favoured extravagant models made of soft kidskin. At festive occasions, on the other hand, one saw ankle boots made of velvet, brocade, or antelope leather peeking out from beneath skirt hems. Equally popular were so-called »elastique bottines«, known for a wedge-shaped elastic insert and complete lack of lacing or buttons. Heels were usually kept flat. After the end of the First World War the ankle boot began to fade into oblivion, as it was increasingly overtaken in popularity by flat »trotteurs«. In the mid-20th century, though, this stylish and elegant footwear re-entered women’s fashion. Since then, it has been primarily subjected to aesthetic considerations. The Chelsea boot is one of the best-known types of ankle boot, and remains popular among women to this day. Known for featuring elastic inserts on either side, this British ankle boot was developed during the reign of Queen Victoria and spread to Continental Europe in the 1960s. All the while this model’s design remained influenced by the comfortable slip-on ankle boots worn in the previous century. The George boot, on the other hand, is a relatively new type of classic ankle boot. Personally commissioned by King George VI in the mid-20th century, its basic shaft cut evokes that of the classic Derby shoe. The George boot known for its open 3-eyelet lacing and quarters that extend far back along the shaft. The roots of the fixed-strap Jodhpur in turn lie in British India. This stylish ankle boot is characterized by cross straps lying diagonally across the ankles. The Jodhpur is hardly distinguishable from an undecorated ankle boot when worn with wide-leg trousers—this shoe’s youthful charm is done the most justice by skinny jeans. Created using the supreme shoe production method, our collection of Goodyear-welted ankle boots impresses with timeless cuts, premium leathers, and a perfectly comfortable feeling on the foot. While our models with classic flat heels follow in the storied footsteps of shoes from centuries past, our ankle boots with a mid-height heel boast a stylish, elegant look. Whether worn with lightweight leisurewear or modern business attire, our ankle boots are an excellent choice for nearly all seasons.